Spread across 15 acres, Warrior’s Village is a camping-slash-picnic spot near Manesar with plenty of adventure, as well as rural activities, a pool, Swiss tents and homey meals. A lush green establishment surrounded by the Aravallis, this is where you can set camp and enjoy all the natural beauty. 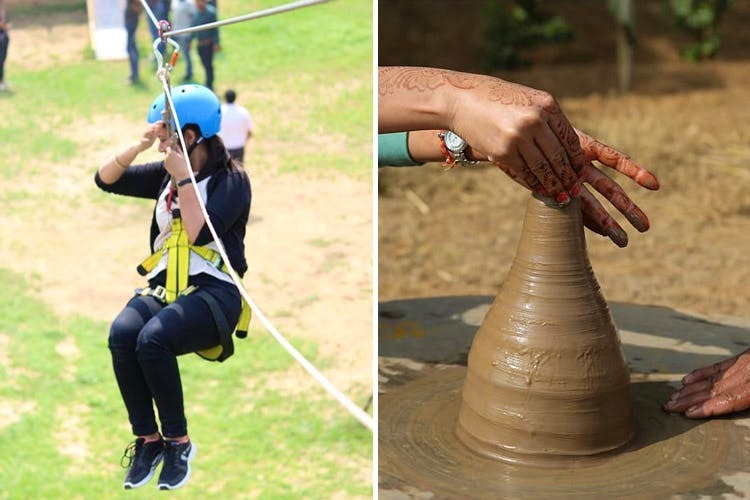 They’ve got plenty of fun activities, including zip-line, a climbing wall, camel ride, horse ride, pottery and more. They’ve even got a swimming pool. So, don’t forget to pack your costumes. Come evening time, you’re free to set up a bonfire and chill with your squad. For when you get hungry, their team will happily serve you warm desi meals (breakfast, lunch and high tea) like sarson ka saag or chole bhature. They’ve got a tie-up with a popular food joint nearby, so you can rest assured that it’s all freshly prepared. We say, it’s an ideal place to spend some quality time with your family or friends on a weekend holiday. Their all-inclusive package for kids is INR 625, and INR 999 for adults. If you wish to stay over at night, you can book one of their 16 Swiss tents (with attached washrooms). But here's the catch- they're only operational from October to March. Outside of those months, you don't have the option of sleeping over.